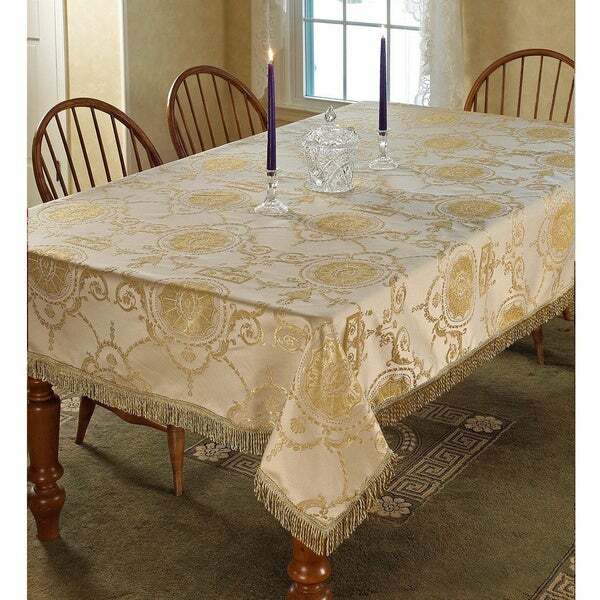 Enhance your dining decor with this damask-patterned tablecloth. Kitchen accessory is accented with a border of gold fringe. Available in beige, burgundy, gold and white color options, it's the ideal finishing touch to your dining decor. Tablecloth is as described and goes well with green and gold colors in my formal dining room. You must iron though after every wash. Not even a wash and line dry to minimize wrinkles will work, but it's worth it. Elegant and Classy looking Tablecloth that resists stains as well . My husband accidentally spilled spaghetti sauce on the tablecloth and I thought I wasn't going to be able to get it out . I pre treated the stain and followed the washing directions and the stain came out . I dried the Tablecloth on low as directed . I was very surprised and happy as I had just purchased the Tablecloth . Elegant, exquisite, well-made, and very beautiful! Our entire space reached a level of true elegance once we covered the tables with these gorgeous tablecloths. We purchased many more in all sizes so that our entrance hall and all surfaces in the meeting room are covered with these burgundy Prestige Damask Design Tablecloths. We hung burgundy drapes and acquired burgundy chairs to add to the amazing affect this decor lends to the room. Our meeting space is now quite love and lively. What fun!!! This cloth looks much more expensive than what I paid for it. The texture is smooth yet heavyweight lays great on the table color is soft and muted.A true bargain. fits great and the color is just perfect. It is the same color as the seat cushions, so no variation. The place mats are gold colored so they match perfectly. The napkins are also perfectly matched as they are also silk burgundy and gold. The place cards are the type you can erase and use again. These last two items were given to me by a friend. Premonition, I doubt it. Even she didn't know they would match so perfectly. I have some gold colored water glasses that will match the napkins and the eating utensils are gold also. Too much gold you say. Well the chargers are a shiny, silky green that just made it all come together, including the centerpiece. Boughs of fir tree with Mexican elder branches and red berries.. Nice table for 8 people. I purchased the Beige, and the main color is lighter in appearance than in the picture, and the design has gold threading which really pops against the beige. 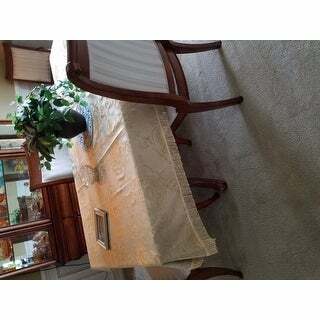 If you are looking for a light beige and gold tablecloth, you can't go wrong with this one. It looks and feels very expensive, and for the price, it is a real bargain. I just received my burgundy damask tablecloth and placed it on my table. It is a perfect fit and is just what I need for the holiday. It can be used all year long in a formal dining room. I would recommend this product to friends and family. 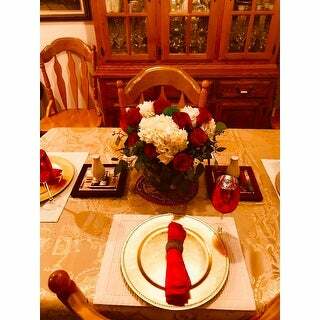 It is absolutely gorgeous and pulls my dining room together with the colors of burgundy and gold! Love it! I liked the design and color beige/gold was perfect but I wished it came in an oval shape. Beautiful tablecloth!! I have both burgundy and beige and they are both really nice. Dresses up the whole room. I would definitely recommend this for anyone who wants a classy new look for their dining room table. Elegant and goes with everything. Beautiful on my dining room table. Better than I expected. "can this fit a round table neatly?" the 60 inch round fits very well.....got one of them in beige for my mom and she loves it ! "I'm buying a tablecloth what is the right size for 6 chairs ? Thank you ." The selections here are all good sizes for tables that seat 6 or more. measure your table top then add about 6" over hang. doing a little diy in kitchen like the color and pattern. For the holidays and other special occasions.